After releasing two albums of original music, the 19-member Divergence Jazz Orchestra have established a unique and inspired artistic voice. 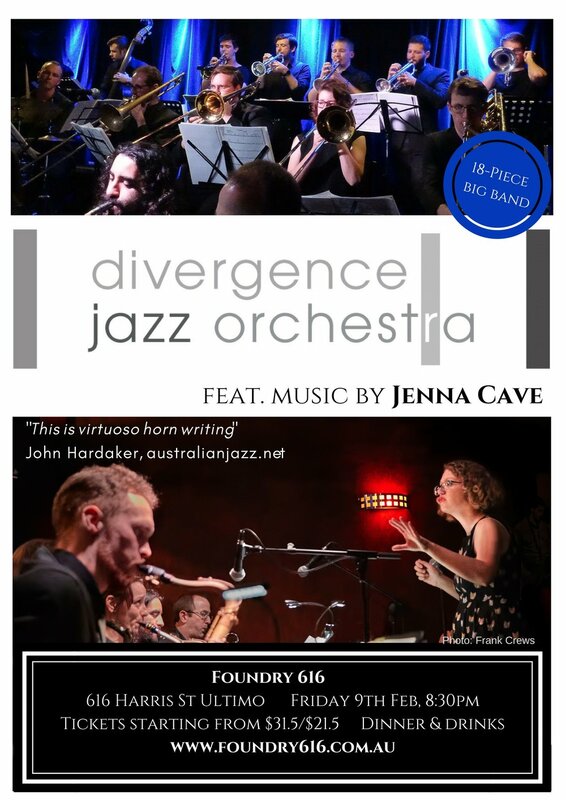 Now, after some time away, Divergence returns to Australia’s premier jazz venue, Foundry 616, to deliver their own brand of Australian jazz music with a monthly Monday night residency beginning on 11 March. 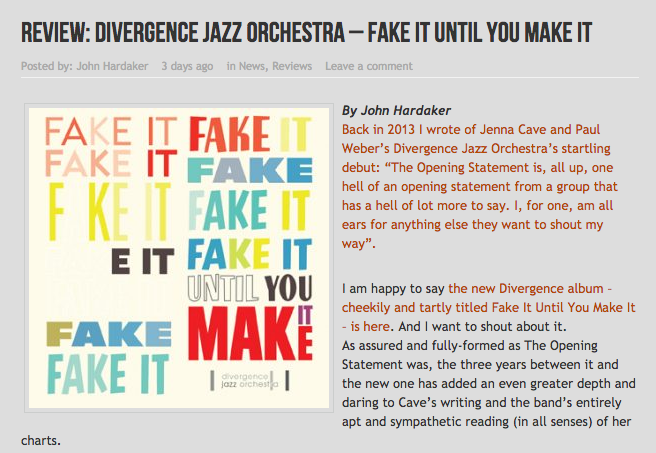 Directed by Jenna Cave (composer/conductor) and Paul Weber (trombone), Divergence boast a powerful and beautifully balanced orchestral sound anchored in groove, exhibiting immense sensitivity and subtly and breaking from the big band tradition of old. Join Divergence as they perform works by leading Australian jazz composers Jenna Cave, Bernie McGann, Miroslav Bukovsky, Andrew Murray, Cam McAllister, Andrew Scott and many more. Each of their tunes featured contain that zest, energy and buzz that are at the core of Divergence Jazz Orchestra’s principles, with an affinity for groove that accentuates the validity and freshness of a jazz orchestra in today’s musical landscape. Saxes: Justin Buckingham (lead alto, flute), Loretta Palmeiro (alto, soprano, flute, clarinet), Scott Kelly (tenor, alto), Louis Klaassen (tenor), Bec Scolnik (baritone, bass clarinet). 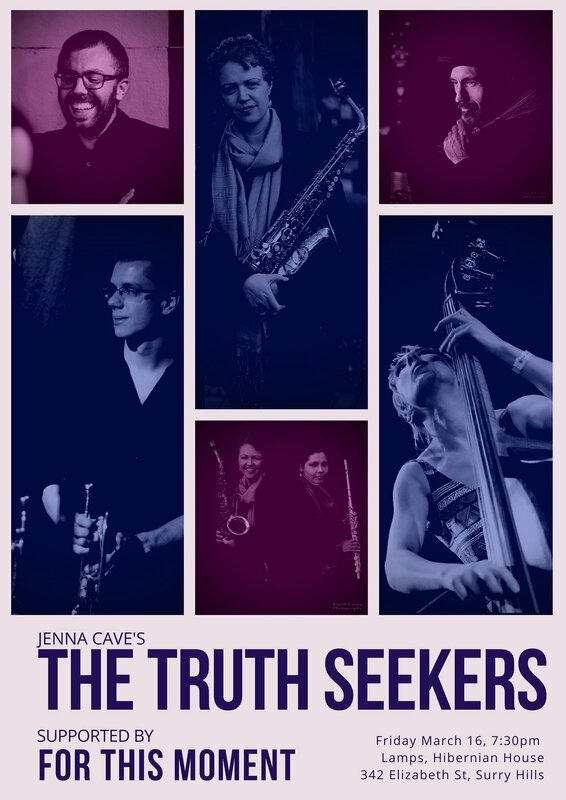 The Truth Seekers is a brand-new ensemble led by composer, alto saxophonist and (budding) vocalist Jenna Cave. Performing a new collection of music, from soulful songs to melodic contemporary jazz sounds, this ensemble showcases Cave’s recent compositional explorations for a smaller ensemble, brought to life and shaped by some of her favorite musicians, improvisers and people in Sydney. For This Moment is improvisation duo comprising of two creative musicians and composers Keyna Wilkins and Jenna Cave. An exploration in what is possible in free improvisation with their available instruments, expect anything from hypnotic textural drones to improvised woodwind duets and strange and contagious grooves. Nothing is off limits as they reference a plethora of musical worlds from free and contemporary jazz, contemporary classical music, to the blues. This concert will feature the music of co-bandleader and conductor Jenna Cave, with a varied selection of compositions written between 2006 and 2018. With a distinctive compositional voice which is both joyful and sophisticated, Jenna Cave’s music has been performed, broadcast and warmly reviewed around Australia and internationally. While co-leading Divergence, she is involved in other projects as a leader, composer, saxophonist and vocalist; and works with jazz orchestras and ensembles around Australia as a guest musical director and featured composer. Cave has been commissioned as a composer by leading Australian jazz festivals and ensembles and for the screen. Justin Buckingham (lead alto, flute), Loretta Palmiero (alto, soprano, flute, clarinet), Scott Kelly (tenor, alto), Louis Klaassen (tenor), Bec Scolnik (baritone, clarinet). 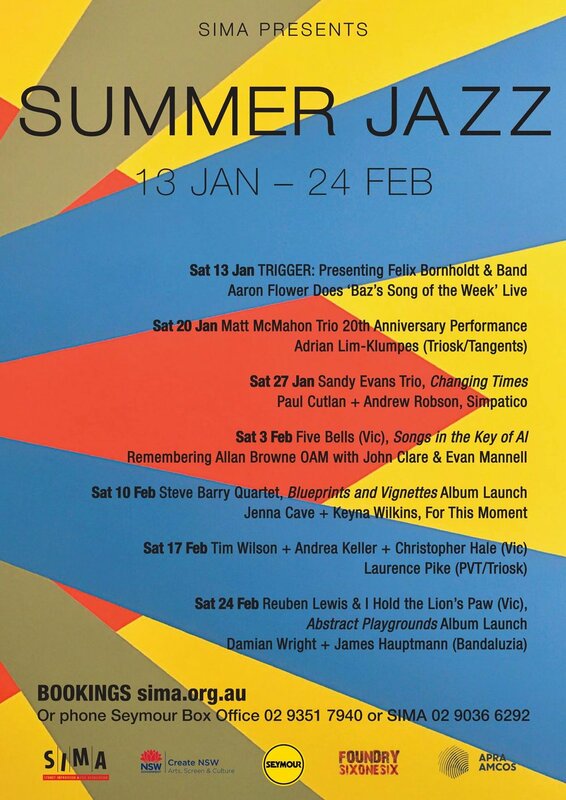 For This Moment (Jenna Cave & Keyna Wilkins) will play a support set at SIMA Summer Jazz before the Steve Barry Quartet launch their new album, Blueprints & Vignettes. I'll be a featured guest composer with the Melbourne Composer's Jazz Orchestra, headed by James Mustafa. We'll do two sets of my compositions! Join us at Foundry 616 to celebrate 5 years of music making as an orchestra. We'll play a selection of music from our early days to recent material. Our improvised duo will perform and afternoon concert at this intimate venue. Afternoon tea will be provided. Keyna Wilkins will be doing a short solo piano set before the improvised duo performance. Tickets must be purchased online before the event, and the venue asks patrons please refrain from wearing high heeled shoes on their soft floor boards. Folk band The Giffen will play before our improvised duo at 7pm. This relaxed music bar in Marrickville have great food and drinks, so come down for an after-work chill. Excited to play at this intimate and nurturing underground space at Hibernian House. Bohemian Grove is a long-time presenter and supporter of experimental music and contemporary jazz in Sydney. Sum of Two Parts (Loretta Palmeiro and Mark Isaacs) will play after us at 8:30pm. For This Moment is a new collaboration between two Sydney composers and creative musicians, Jenna Cave and Keyna Wilkins. Limited only by their chosen instruments and their imaginations, this music explores the ways in which two independent melodic lines can meet in free improvisation to create a meaningful and cohesive compositional whole. On Thursday August 6th 2017, 8:15pm they have their debut performance, at an underground performance space in Sydney's Inner West. They will be supporting other groups Metanoia and The Coconut Kids. Email for venue details. In this exciting new collaboration Divergence Jazz Orchestra welcomes Michael Griffin (alto saxophone) as featured soloist. They will premiere Griffin originals newly arranged by Jenna Cave, Paul Murchison and Dave Lisik; compositions from the band, plus music from Bernie McGann (arr. Cam McAllister), Bill Motzing and Miroslav Bukovsky. Expect a night that takes you from be-bop to funk, hard-bop to ballads to contemporary jazz sounds. Hailing from Sydney, Michael Griffin is a sensational young alto saxophonist who has been making waves in Australia and the US. Drawing on the linage of the great bebop alto saxophonists, Griffin’s improvised solos are executed with flawless time and artistry, his playing praised by jazz greats Jimmy Heath and Vincent Herring. Divergence Jazz Orchestra are thrilled to announce that we will continue our collaborations with acclaimed trumpeter and composer Miroslav Bukovsky in 2017 with a performance in the upcoming SIMA SUMMER JAZZ concert series. We are honoured to be included in a program of such luminaries on the cutting edge of contemporary jazz and improvised music in Australia. With Bukovsky as a our guest soloist, we will perform some exciting new material co-written by Bukovsky and Jenna Cave, new works by Andrew Scott and Paul Cutlan, and a selection of Bukovsky classics re-imagined for an orchestra of 19 musicians. This will be proceeded by a support set featuring Loretta Palmeiro (sax) and Andrew Scott (piano) performing in a rare duo format. In 2010 Jenna composed her String Quartet No. 1, a substantial work in three movements. Written in the composer's own musical voice, the work would best be described as a contemporary piece with an emphasis on rhythmic interplay between instruments and shifting modal harmonies, drawing influence from the sound worlds of post 1960s jazz and composers such as Bela Bartok and Maurice Ravel. This month will see the world premiere performances of two versions of this work. New York bassist Ron Wasserman leads various innovative projects and ensembles moving between the worlds of classical music, dance, jazz orchestras and trad jazz. In December he is curating a bar recital of jazz influenced works for string quartet and string quartet with bass, performing with the Yeats String Quartet. The recital will include the world premiere performance of Cave's original String Quartet No. 1 (2010). Our brand new album Fake it Until You Make It has been rated 4 stars in the Weekend Australian newspaper by Jazz writer John McBeath, along with a nice summary of our new release. 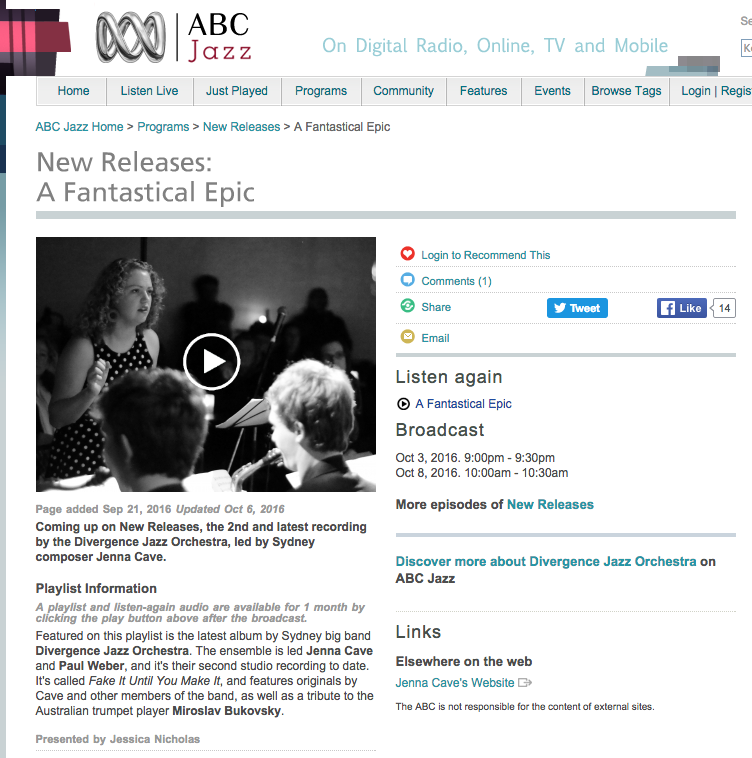 In August of this year Jenna was commissioned by the Sydney Improvised Music Association, with the assistance of The Australia Council for the Arts, to write two new works to be premiered by the new 10-piece ensemble ‘Sydney Women’s Jazz Collective’ at the 2016 Sydney International Jazz Festival. The ensemble will perform the new compositions Chasing Sound and Long-lost Frenemy on November 4 and 7.